Jim Beam, has announced that it has filled its 15 millionth barrel of bourbon; a first for a Kentucky distillery. 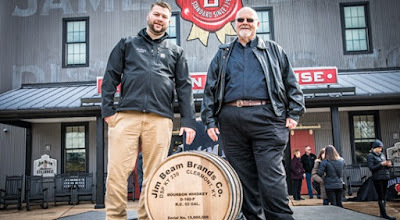 The milestone barrel was filled and sealed by Seventh Generation Master Distiller Fred Noe and his son Freddie Noe, Eighth Generation Beam Distiller, at the brand’s flagship distillery in Clermont, Kentucky. The historic milestone, was achieved less than two years after Jim Beam filled its 14 millionth barrel, the shortest period of time between milestone barrel fills, which serves as a testament to the continued global bourbon boom. The 15 millionth barrel, which was signed by employees at the company’s Clermont, Boston and Frankfort plants, will join the nearly 2.3 million barrels of bourbon currently aging in Jim Beam’s rackhouses. It will be stored inside the distillery’s historic rackhouse D, a nine-story warehouse rebuilt by Jim Beam after Prohibition on the Clermont distillery grounds. According to the Kentucky Distillers’ Association, bourbon is now an $8.5 billion state industry, supporting more than 17,500 jobs and generating more than $1.8 million in tax revenues annually.